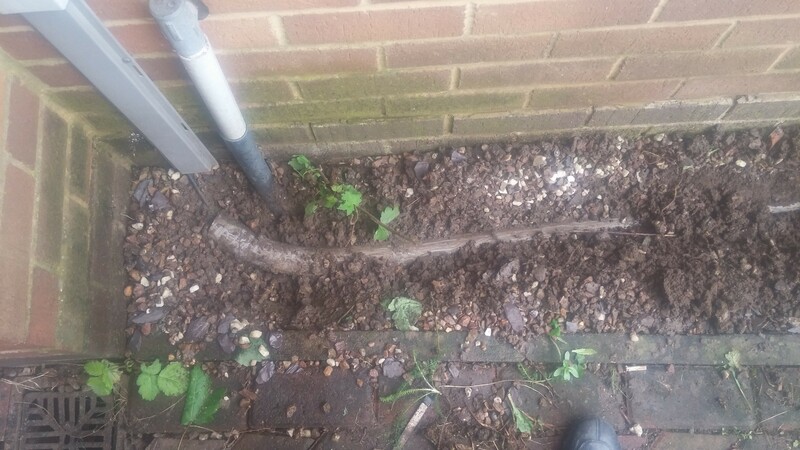 We're fed by an underground cable, and on replacing the master sockets recently with NTE5Cs (we have two lines, both used for broadband only - one VDSL, one ADSL), I discovered the cable coming through the wall was a 3-pair internal cable. On the opposite side of the wall, there is the common Capping 25/Cover 101 combination, and on removing the cover I discovered (hidden amongst the dust and dirt) that the two pairs from the incoming cable had been jelly-crimped to the internal cable. Is that common practice? I would have expected the feed cable to go through the wall, or at least a BT66 box instead of just leaving the crimping in the Cover 101. 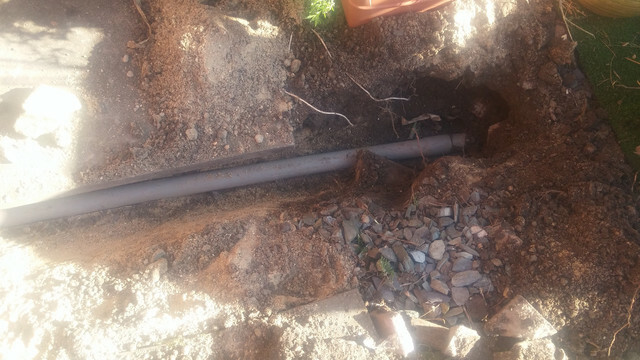 On digging further (literally), I then discovered the incoming ducting stopped short about 3 inches from the bottom of the Capping 25, with the cable coming up exposed through the soil. 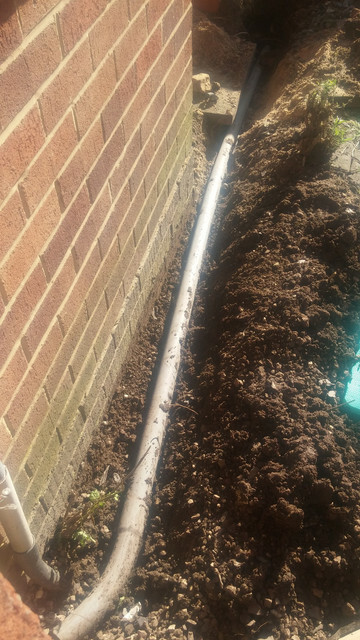 The ducting is also only about 3 or 4 inches below ground level - it comes in horizontally along the side of the house, and then just stops. 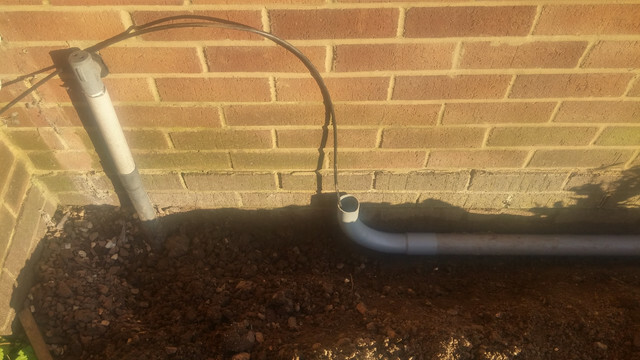 On reading the current Openreach developers guides, it seems clear that this install doesn't meet Openreach's current specs for new builds (ducting buried 350mm-450mm, with a 90 degree bend taking it up to the outside wall of the house). Our house is on a small estate built in 1990, and we've lived there since 2000. We're intending to have the area on top of the ducting paved, and hence have a need for the ducting to be buried deeper, and also to extend all the way above ground level (adding a 90 degree bend) to retain access to it after the paving is installed. 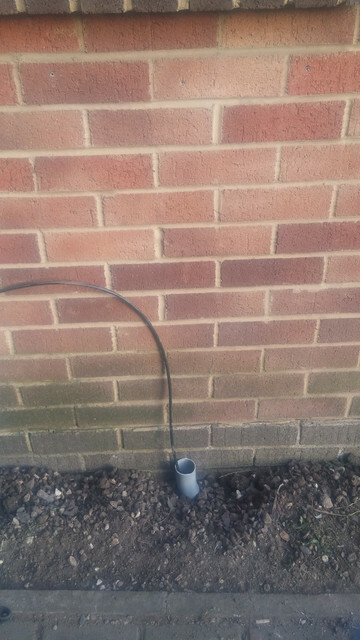 Rearranging the ducting would also give the opportunity to shorten it a couple of feet and hence gain enough of the original cable to feed it directly through the wall and terminate it directly on repositioned master sockets (eliminating the exterior join and the short run of internal cable). My main question is around which master socket(s) to use to minimise any signal loss (I have high speeds already - VDSL attainable speed is about 80200/27000), I just want to squeeze out every last attainable bit/s, to give it a bit more headroom above the magical 80000, and future-proof it as far as I can. I'm not impressed at all with the new NTE5Cs - apart from the common criticisms (cheap and flimsy), they also need to be installed with some space between them to allow the removal of the faceplates. Needing two sockets, it would be nicer to be able to position them directly adjacent to each other. Being broadband-only lines, I don't use filters, and just connect using short BT431A to RJ11 cables to HG612s close to the master sockets. I'm quite tempted by the old LJ4/1A dual master socket (which I could surface-mount in a metal backbox), as it would allow easy termination of the incoming cable on a single socket, without needing to crimp an extension cable to a second socket. This would seem to give me the most "pure" signal. 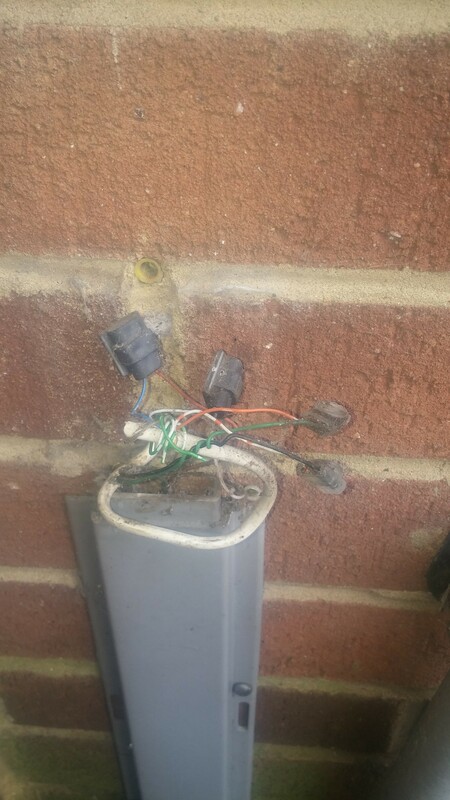 I was wondering what Openreach's attitude to that socket is nowadays. If I ever needed an engineer visit, would they be looking to replace it with a pair of NTE5Cs ? The alternative I think would be a pair of NTE5As. How would Openreach ideally terminate a 2-pair cable onto two master sockets? Would they always terminate it in one socket, and then jelly-crimp the other pair to a short cable to take it to the second socket? Also, has anyone done any comparisons of the performance of the different master sockets in relation to DSL? Or am I worrying about nothing, and assuming everything internal to my house is good quality and connected properly, there's not going to be any difference? We're fed by an underground cable, . . . I discovered the cable coming through the wall was a 3-pair internal cable. On the opposite side of the wall, there is the common Capping 25/Cover 101 combination, and on removing the cover I discovered (hidden amongst the dust and dirt) that the two pairs from the incoming cable had been jelly-crimped to the internal cable. I would say that is not too uncommon. That proposal reads to be very sensible. I presume you have considered aligning them in a vertical rather than in a horizontal sense and have ruled it out, as the visual appearance would be inappropriate. With a property as new as your own, seeing a LJ4/1A would cause me to raise an eyebrow! As to your question, I think you know the answer. My choice would be two NTE5/A and one double-gang metal backing-box recessed into the wall. The service feed cable would be cut back, leaving a generous length, and the outer sheathing carefully stripped back to expose the pairs. You should now have sufficient length to connect each pair directly to each NTE5/A. Also, has anyone done any comparisons of the performance of the different master sockets in relation to DSL? Nothing of which that I am aware. Or am I worrying about nothing, and assuming everything internal to my house is good quality and connected properly, there's not going to be any difference? Worry not, for I suspect your musings will be correct. And finally -- "Welcome to the Kitz forum." Thank you both for your welcome, and many thanks to burakkucat for the detailed reply to my ramblings. I hadn't considered and rejected the idea of two NTE5Cs mounted adjacentally in the vertical direction, but have now.
. . . many thanks to burakkucat for the detailed reply to my ramblings. I've been making progress with this, and thought I would upload some before and after photos. Here are the before. Ah, yes. Those images match up, more or less, with how I pictured the situation from you typed description. I presume you'll be using a 2 x single gang back box, like this? The cable can be brought in through the back and spilt to reach both sockets. That is exactly the type I was thinking about when I posted the above suggestions . . . but I forgot to provide a link to an example. Thank you for rectifying the deficiency. Edited to add: Don't forget a 20mm open grommet. Thanks for the advice - yes, I already had a suitable back box (and grommets). The cable is (temporarily) jelly-crimped again to the old bit of internal cable going through the wall. I've drilled a 12mm hole through the wall, and am currently fighting with the brick to chisel out a recess to mount the back box. I gave up this afternoon and went to the park with the family instead Back to it tomorrow (I've temporarily sealed the ducting). As I mentioned in my original post, we're intending to get this area paved/concreted, so am assuming I should wait until that is done until I add the BT Connector Bend 4 and finish the outside part of the job. My understanding is that the ducting should be protruding about 50mm above ground level (which it is), and then the Connector Bend 4 sits flush on top of the ground. Does that sound right? Here's the Connector Bend 4 I bought. I've drilled a 12mm hole through the wall, . . .
At 5 degrees upwards from the horizontal, when drilled from the outside? And once wired, the gap around the cable could be filled with silicone sealant.
. . . so am assuming I should wait until that is done until I add the BT Connector Bend 4 and finish the outside part of the job. I can think of no reason why you should wait for the new surface to be laid. So do whatever is the most convenient. Yes, I don't think that could be faulted! Can't promise it's exactly 5 degrees, but yes, I attempted to aim slightly upwards when drilling (which I did from the outside). And yes, the silicone sealant is waiting. It's because I don't know exactly where the ground level will be, and want to be able to seat the connector bend 4 flush on top of it. We're hoping to get that done in the next couple of weeks, so I'm happy to wait, and just put up some temporary protection in the meantime. Yes, I've been referring to that a lot too. Nice that Openreach make it publically available. Nice that Openreach make it publically available. I'm now done with this. I've re-covered the external cable, sealed the cable entry with some silicone sealant, and flush-mounted the two NTE5/As on the opposite side of the wall. So I now have a properly ducted service feed cable coming through the wall and connected directly to the two master sockets. 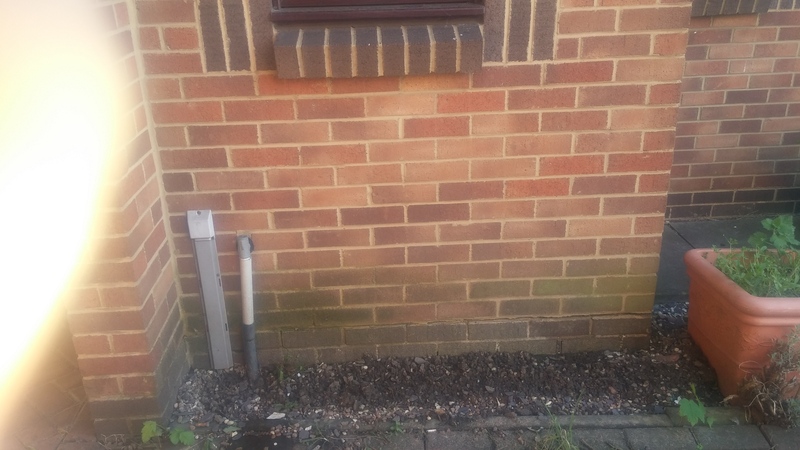 The wall where these two master sockets are now installed had 4 CAT5e cables running between the brick and plasterboard, going to a four-way CAT5e socket just above where the master sockets now are. As part of this work, I commandeered one of those cables, and re-routed it behind the plasterboard into the master sockets. I then used two of the pairs in this cable to connect to the 2/5 IDC connectors on the front plates of the two master sockets. The CAT5e run back to my patch panel in the cupboard under the stairs, where I've now relocated my modems. This takes each of the four pairs from the input RJ45 connector and puts them on pins 4 & 5 on their own RJ45 socket. I then have a couple of run-it-direct 1m RJ45 to RJ11 cables to connect to the modems. Whilst doing all this, I've been keeping a close eye on the max attainable and actual sync speeds for both my VDSL and ADSL lines. Currently the VDSL has a max attainable of 80732/27489, compared to 80260/27306 before. Actual speed is still 80000/19999. The ADSL is currently 14256/1216 (actual 13543/1211), compared to a max before of around 14192/1132 (actual 13423/1083). 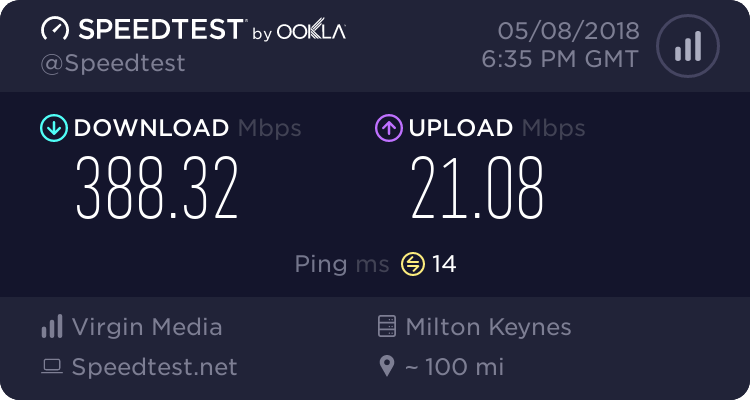 The ADSL did seem to vary quite a lot though, so I'll need to monitor that over the next few weeks, to see if it's any more stable. So at least I've done no harm (assuming things stay stable), and now have the modems hidden out of sight.